Callum Smith has scored four hat-tricks for Westfield during a goal-laden season. Westfield Football Club is involved in something of a tug-of-war with Tunbridge Wells over prolific forward Callum Smith. 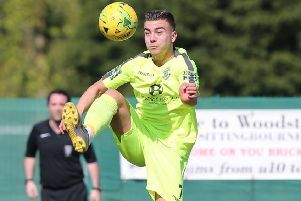 Tunbridge Wells tweeted on Sunday that Smith had signed for them on a dual registration basis with Westfield, for whom he has scored a remarkable 31 goals this season. Smith was expected to feature for Tunbridge Wells in their Southern Counties East Football League Premier Division match at Hollands & Blair on Wednesday only for it to be postponed. Stapley added that Westfield’s 1-1 draw at home to Rustington last weekend illustrated just how much they miss Smith when he’s not in the side. Smith was serving a one-match ban, but was watching on from the sidelines and is available for the Macron Store Southern Combination Football League Division Two game away to Worthing Town Leisure this coming Saturday. Fellow attacking players Asher Grindle, Josh Carey and Jake Barrett should also return for a Westfield side which has slipped a place to fifth in the table with 10 league games remaining.